OBJECTIVES: The purpose of this study was to assess the effect of Tai Chi Chuan (TCC) on fall prevention, balance and cardiorespiratory functions in the elderly. METHODS: A systematic review was carried out according to the Cochrane standards. A computerized literature search was carried out. Studies were selected when they had an experimental design; the age of the study population was >50; one of the interventions was a form of TCC; and when falls, balance or cardiorespiratory functions were used as an outcome measure. A total of seven studies were included, with in total 505 participants, of whom all but 27 were healthy seniors, age between 53 and 96 years. RESULTS: In most studies, the intervention of TCC is a modified Yang style, varying from 10 to 24 forms. The intensity of TCC varies from 1 h weekly for 10 weeks to 1 h every morning for 1 year. One study used falls as outcome measure and reported a beneficial effect of 47% in the TCC group. All studies mention a beneficial effect of TCC, but in most studies this conclusion was based on a pre-post analysis. 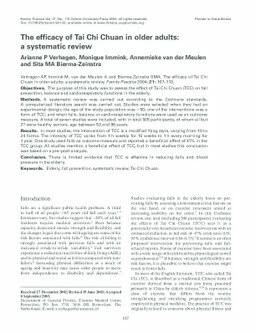 CONCLUSION: There is limited evidence that TCC is effective in reducing falls and blood pressure in the elderly.